Over two and a half thousand light years away, embedded in a glowing blue reflection nebula, lies a twinkling of stars known as the Christmas tree cluster. This festive cluster was discovered by Sir William Hershel during his great sky survey in the late 18th century. The wisps of gas and dust that form the coniferous frame of the tree stretch over 40 light years across, covering an area of 1.5 full moons in the night sky just to the left of the deep orange shoulder of Orion. The bright O star at the base of the tree can be seen with the naked eye and shines with the luminosity of over 8,000 suns. As a string of over 20 bright young stars brighten up the gas above, like fairy lights highlighting thick shawls of dust tinseled through the sky. These are accompanied by a group of stellar newborns called the snowflake cluster hidden in the optical by the thick dust of the trees shell. 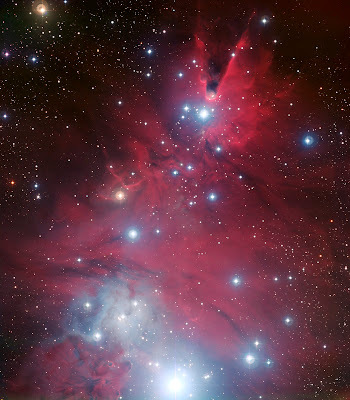 Adorned upon the top of the tree is the birthplace of stars, the great cone nebula, protruding downwards as if it were the tip of a giant ornament perched on the edge of the tallest branch. This star nursery, 65 times larger than the diameter of our solar system, is slowly eroding the surrounding gas as its hot, young stars excite the gas to the encompassing space. But fear not, this Christmas tree will be lighting up the sky for millennia to come revealing new stars as they are born and sending out Christmas cheer across the galaxy.